This tasty, easy lunch salad is a great combination of crunchy and creamy, peppery and sweet. Placing the dressing on the bottom with the sturdier ingredients keeps the salad from wilting till you’re ready to shake it up, transfer to a plate and enjoy! Combine vinaigrette ingredients and place in bottom of quart Mason jar; add pears. For smaller salads, divide the ingredients between two wide-mouth pint jars. Add 1 1/2 cups of spinach, layer radishes on top of that and follow with remaining spinach. Top off with pecans and Parmesan cheese; seal and refrigerate until ready to eat. 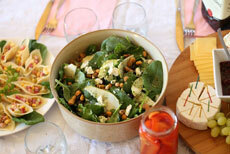 To serve tilt and rotate jar to mix vinaigrette, unscrew cap and place salad in serving dish of choice. Variation: Pomegranate seeds are a tasty substitute for the radishes.